Announcement New paintings debutting ... Something Red's "Something" trio of alcohol ink & resin landscapes. New paintings debutting ... Something Red's "Something" trio of alcohol ink & resin landscapes. Entrance to Mission Mill watercolor en Plein Aire CC Willow original 9.5X13"
I ordered two packs of these cards to send to friends! The prints are lovely and the cards are well made and designed. I've already prepared 8 of the 10 to mail out! They are very nice size for short notes. I was slightly disappointed when due to a technology snafu, my order shipped a bit later than expected. I assume this is a one time issue though and wouldn't let it stop me from ordering from CCWillowArt again! CC Willow at one of 2017 Paint The Town's event. 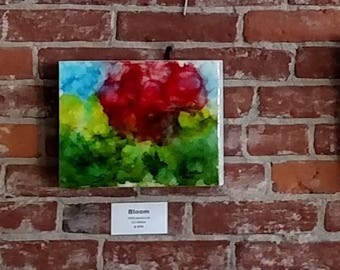 Participent in the Monthly Final Friday Salem Art Walk, Downtown Salem Oregon. Participating in Oct 2017's 13 Skulls Art Show, Prism Gallery, Downtown Salem Oregon. Salem Art Walk Shenanagins - CC Willow & Janet Reese! CC Willow (born Cynthia G. Evans) is a daughter of Oregon artist Virgil L Evans, Jr., CC grew up watching her father always painting & sketching. As a child, when he would take her to the county and state fairs, her father would not let her go on the rides until after she had critiqued the paintings in the Fine Arts display. Always envious of those with the talent to paint, she finally mustered enough courage to pick up the paint brush. “My father trained me in the eye of composition and the theories, I just needed to learn the tools. The hardest thing for me is to develop my own “voice” in painting. To not copy my dad’s.” Her art can be seen on her facebook page CC Willow Arts. CC Willow took her brush name from her former environmentally-conscious interior decor firm, CC Willow. She started painting accessories for her clients when she could not find those needed. CC Willow uses acrylics, watercolor, oils and inks in her artwork. She also enjoys digital photography and hopes to offer some of that soon. Her artwork is constantly evolving. She is a current member of Salem, Oregon's Artists in Action (AiA). CC participated in her first Art Show , Salem, Oregon's "Somenthing Red" in 2008. She has since participateed in other Oregon Art Shows such as SisterArts' "Images of the Metolius", Keizer's Art Association "Black & White Show, and Artists in Action's "Wm Stafford Centennial Art Show in Nov 2014. CC Willow Arts officially started as an online store in 2014 on eBay, at which time Tavis joined as assistant with the online aspects. April 2016, it seemed more reasonable to move our original art store to Etsy, and Frodo & Oreo became official staff. A widow, CC Willow lives in Salem, OR with her son and furry housemates; camping often in the Cascades or in Central Oregon. She also writes poetry as Ariel, NW poet, and is quite active at northwest Spoken Word events. Both She & Tavis are quite active in community theater, both on stage and in the wings. And weekdays, they are both active with boxwood Cottage their online- re-selling business - acquiring, researching, cataloging, listing, shipping. CC Willow, grew up watching her father, Virgil L. Evans Jr, always painting & sketching. She has been painting since 2003. CC Willow also co-owns Boxwood Cottage (eBay). She is also known as Ariel, NW poet, and as Thia Evans, actress. Tavis, HR's favorite, assists with the business side of CC Willow Arts and is co-owner of Boxwood Cottage on eBay. Tavis has a very active actor in the Willamette Valley community theaters for many years. He has a passion for forest biology. Oreo spends her days and evenings overseeing our operations. Just don't expect her to let you have her chair. Like Frodo, she is willing to offer her shelf-sitting talent for our photos. Oreo's hobbies include listening to music and stealing food. Frodo, our junior member, is our HR manager and juggles our facility concerns as well. We are lucky he is willing to moon-light for us as one of our models. Frodo's hobbies are catch & release hunting, snow sports, and wrestling. Tavis, HR's favorite, assists with the business side of CC Willow Arts and is co-owner of Boxwood Cottage on eBay. Tavis has a very active actor in the Willamette Valley community theater. He has studied forest biology and loves camping.